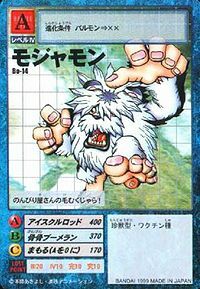 A hairy Rare Animal Digimon completely covered in white fur. It lives in the hinterland of snowy mountains, and it is very unlikely to come across one. There are many reported sightings of Mojyamon, but no evidence to prove its existence, so for a long period it was considered to be a Digimon based on myths. With its carefree personality, it is never belligerent. However, it considers its den and territory to be sacred ground, and it will never permit this sacred ground to be invaded. 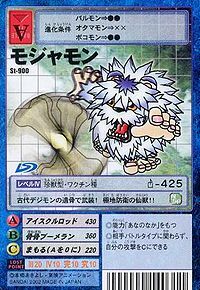 Its Special Moves are a gigantic icicle made by causing the moisture in the atmosphere to instantly freeze (Icicle Rod), and throwing the bone of an Ancient Digimon which had become fixed in the ice (Hone Hone Boomerang). A hairy Rare Animal Digimon completely covered in white fur. It lives in the hinterland of snowy mountains, and it is very unlikely to come across one. 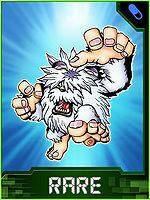 There are many reported sightings of Mojyamon, but no evidence to prove its existence, so for a long period it was considered to be a Digimon based on myths. With its carefree personality, it is never belligerent. However, it considers its den and territory to be sacred ground, and it will never permit this sacred ground to be invaded. From mojyamojya (「モジャモジャ」) which means "hairy". アイスクルロッド Aisukuru Roddo Ice Cloud/Icicle Fire Tosses a spear of ice. 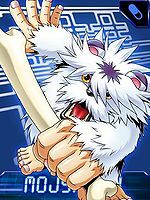 Hone Hone Boomerang  Bone Bone Boomerang 骨骨ブーメラン Hone Hone Būmeran Bone Boomerang Throws a bone stolen from Garurumon like a boomerang. Dances towards the foe and punches. A Mojyamon fell under the control of a Black Gear and attacked Taichi, Yamato, Agumon, Gabumon, and Yukidarumon. However they succeeded in destroying the Black Gear, freeing him. In "Digital Gate Open", a Mojyamon is among the Digimon controlled by the Digimon Kaiser's Evil Rings. Another Mojyamon appears in China in "The Great Free-for-all Fight in New York and Hong Kong!". 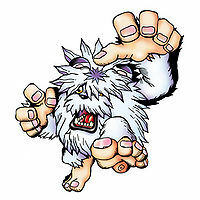 A Mojyamon is pictured as one of the Digimon killed by Kurata Akihiro's forces. 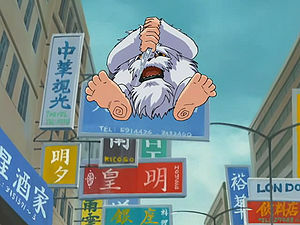 A Mojyamon is one of the Digimon hunted by Tobari Ren. 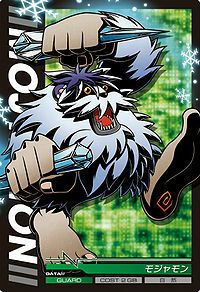 Mojyamon appears as an obtainable Adult-level Vaccine type Digimon in Digimon World. 3 Mojyamon inhabit in the ice flows of Freezeland. Mojyamon are traders by nature and each Mojyamon will offer you 3 different items in exchange for what they desire. For example, the southwestern Mojyamon will offer you a Special Offense Disk in exchange for a Digi-Anchovy you give to it. When you have traded every single item to every one of the 3 Mojyamon, the last one you trade with will join to the Village of Beginnings, assisting in the Secret Item Shop, along with Igamon, Mamemon, Devimon and Numemon, seeling Rest Pillows and Health Shoes that heal your Digimon's tiredness and HP, Mojyamon's characteristic Digivolution item. Mojyamon's schedule in the secret Item Shop coincides that of Patamon's, working from early morning to afternoon. CAUTION: When doing this trick, always carry an Auto-Pilot with you. That's because the Mojyamon you'll be trading with has a glitch that makes the Player stuck, unable to move. To avoid getting stuck, the Player must use the Auto-Pilot to return back to the City. CAUTION: When trading with the Mojyamon, be sure to trade all of the 3 required items to the southwestern Mojyamon first than the other two. This is because if that Mojyamon is the last one to be traded, it will join the Village of Beginnings and you can't trade with it anymore, losing the money making exploit. Bonus conditions: Battle less than 5 times and have at least 28 different techniques mastered. Mojyamon's Digivolution item is the Hair Grower which lets any Child Digimon evolve into Mojyamon. 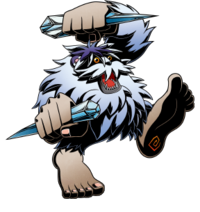 Mojyamon tosses a bone like a boomerang that will strike the enemy, although sometimes, the bone will hit and deal damage to the Mojyamon instead. Mojyamon is an obtainable Digimon. Evolves from Yuki Agumon (3-5 DP) and can evolve to Monzaemon (0+ DP). 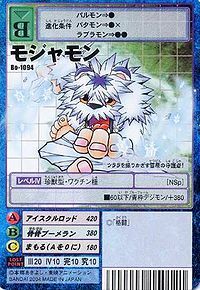 Can be evolved from Bearmon if above level 21, Beast EXP 220, and Water EXP 180, or can be found at Access Glacier. Can evolve to Mammon if above level 35, attack 180, and defense 185. Evolves from Gomamon. Can evolve to Mammon, Blue Meramon or Pandamon. Evolves from Gomamon at level 11 and can further evolve to Piccolomon at level 25. Mojyamon is available as a Digimon Medal. 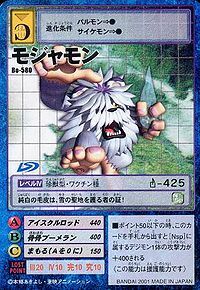 Mojyamon is available as a Digimon Card. Evolves from Palmon. Can evolve to Piccolomon. Mojyamon is an enemy Digimon in Area 01 and 02. It arms itself with the remains of ancient Digimon! A hermit Digimon who protects the polar regions!! This easygoing Digimon is covered in thick fur! Its pure-white fur is proof of its role as the protector of the snow-covered sacred lands! This guardian of the snowfields brandishes an icicle! 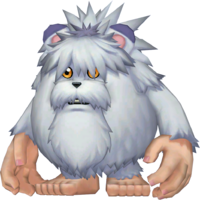 A rare Digimon that is covered entirely in thick fur and lives quietly in the snowy mountains. Though it normally has a docile personality, it shows no mercy to those who desecrate its residence or territory, and will attack them with the freezing air of the great mountains. This page was last modified on 12 April 2019, at 21:14.